Friday Reads: Fourth of July! Are you ready for the long holiday weekend? Looking for something relevant to read? The Fourth of July—also known as Independence Day or July 4th—has been a federal holiday in the United States since 1941, but the tradition of Independence Day celebrations goes back to the 18th century and the American Revolution. 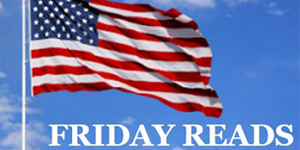 To honor the occasion, this Friday Reads installment turns to no lesser topic than America itself, from a variety of perspectives and with something for everyone. So here’s to life, liberty and the pursuit of happiness! Before there was “Hamilton”, “1776” took to the stage in 1969 winning five Tony Awards, including Best Book and Best Musical, this oft-produced musical play is an imaginative re-creation of the events from May 8 to July 4, 1776 in Philadelphia, when the second Continental Congress argued about, voted on, and signed the Declaration of Independence. The surprising story of how Thomas Jefferson commanded an unrivaled era of American exploration—and in doing so, forged a great nation. More than four decades after his death, John Steinbeck remains one of the nation’s most beloved authors. Yet few know of his career as a journalist who covered world events from the Great Depression to Vietnam. Now, this distinctive collection offers a portrait of the artist as citizen, deeply engaged in the world around him. A magnificent history of America told through 101 objects taken from the Smithsonian’s collections, the country’s largest and most important, selected by the beloved head of its history, art and culture museums. Immigration is the essential American story, though one often told in terms of its impact on those already here. Becoming Americans tells this epic story from the inside, gathering for the first time over 400 years of writing by first-generation immigrants about the immigrant experience. Lively and iconoclastic, America First! explores the rich heritage, turbulent present, and possible future of the political and cultural tendency known as “America First.” Bill Kauffman, a columnist for the American Conservative, examines the nineteenth-century underpinnings and twentieth-century eruptions of American isolationism and nationalism. Step back in time to the birth of America and meet the real-life rebels who made this country free! Selections from M. Sasek’s most popular illustrated children’s travel guides compiled into one big look at the United States and its unique history.